Security was cleared, and we were sitting in one of the cafes in Glasgow International Airport when we hear over the tannoy, that we need to go to the gate as we were getting ready to board. My parents had done the same trip a few months earlier, and although they had told us what to expect, it was still a shock to see. There was no ‘walkway’ to get to the plane. Instead, we had to walk from the building to the plane across the tarmac. Instead of a usual 100 seater (or so) plane, the airplane was a small 12 seater, with two small propellers on view from the engines. Now I’m not the best of flyers, so imagine my surprise. My parents were not exaggerating. Onboard, the seats were tiny. My husband and I were sitting in one of the twin seats… I swear that if we were 2 inches wider, we never would have been able to sit down. The doorway to the cockpit was left open, and just before takeoff, the pilot turned around to give instruction on what should happen due to an emergency. I was fortunate enough to have, if you can call it this, an aisle seat. My husband was sitting next to the tiny window… Which was part of the emergency exit door. Instead of the usual, large, clumpy handle to release the door was a rusty, used looking car door release handle. I looked around. Apart from the door at the rear of the plane – the one with the steps to board – this was the one to be used as the emergency exit. The flight was relatively smooth. We were in the air only 6 seconds after acceleration. Still, the door to the cockpit was left open, and I could see the tiny windscreen wipers swishing across the window quickly. It was only 3/4 of an hour after we took off that I leaned across my husband to peer through the window. I managed to look down… The scenery was amazing. The deep blue coloured sea against the beautiful pale blue sky. The sea had small, rocky, inhabited isles. I could tell we were nearing landing. Just then, the co-pilot turned to say we were 10 minutes from landing. Touchdown. The landing was so smooth. I barely felt the wheels hit the sand. 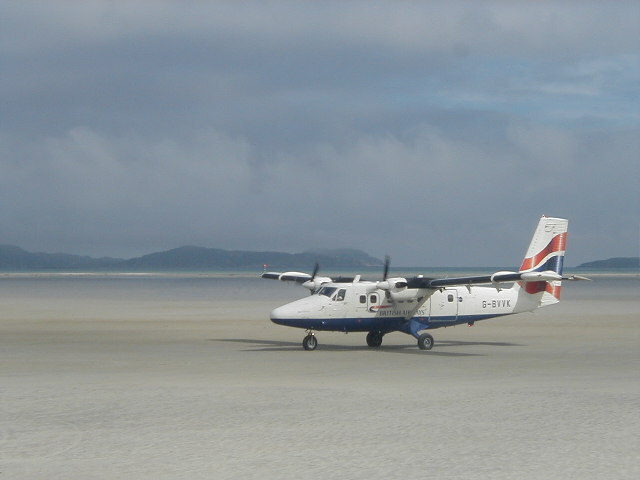 The run up to the airport building was not as smooth… Taxiing across the beach was bumpy. We felt every ripple on the beach. I think it was relief that we had landed (as aforesaid, I’m not the best flyer in the world), that I just started giggling like a chipmunk. Once off the plane, it was time to collect our luggage. We only had one backpack between us, as we were only there for 2 nights. My husband asked one of the security guards in the building (which actually resembled a large tourist information centre) where we collect our bag… “You’ll find it in the shelter outside…” was the response. And so we headed outside. We followed the signs to the luggage collection point and, well… Talk about another shock. The ‘shelter’ that the guard had described was nothing more than a bus shelter. My husband and I started laughing. We arrived at the Craigard Hotel, 3/4 of an hour away from the airport by bus (cost about £1.20 each), early Saturday afternoon. The check-in at the hotel was quick and easy, and Julian (the owner of the hotel) answered all of our questions. We were looking to hire a bike to see the island on the Sunday, and Julian told us exactly where we needed to go. He also told us that if the place was closed to come back to the hotel and he would sort something out to get the shop opened for us! The owners, Julian and his partner (I didn’t get her name) are originally from Stafford, and emigrated to the Isle of Barra a couple of years earlier. The room was a nice size, tastefully decorated with stunning views across Castlebay. The bed was more comfortable than our own at home, and there was always plenty of sachets available in the room to make drinks. The restaurant was closed because it was too cold to sit in there, so we had our dinner in the lounge. The selection of food was fantastic, and the service incredible. The fish was so fresh, and served very quickly and with a smile. My husband and I both had a starter and a main course, and although we wanted it, we had no room for dessert. The following morning we were in the breakfast room having porridge and a full Scottish cooked breakfast. The view from the breakfast room looking out to Kisimul Castle is amazing. During the night, there was a storm that hit the Island. Torrential rain, winds, snow, hail and a thunder & lightning storm was holding out, and looked set in for the day. Julian came over to see how we were getting on to which I replied “I don’t think we’ll be getting the bikes today”. His response was something that you will never hear anywhere else in the world – “Meet me in the reception about 11am and I’ll take you around the island so you can see what you came for”. 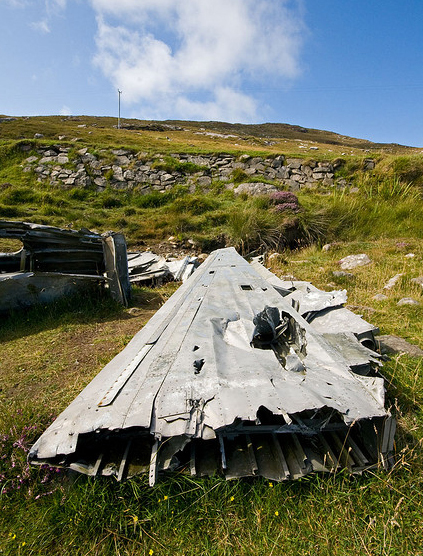 He was absolutely fantastic… He took us around in his Landrover, over to see Vatersay, he pointed out various beaches and sights which we would have missed on our own… He even took us to the remains of the World War II plane that had crashed on the island due to bad weather. All the staff in the hotel and bar were amazing people. They go out of their way to help you. The prices are very reasonable, and the food & drink divine. Wherever you live in the world, if you ever intend on visiting Scotland one day, I highly recommend this trip. Landing, and taking off the beach here is literally a once-in-a-lifetime trip.